I always get asked what topwaters work best? Well, a picture is worth a thousand words. The winds of April, will we ever get a break? Fishing from the boat when the winds are sustained 15-25mph everyday is extremely tough. 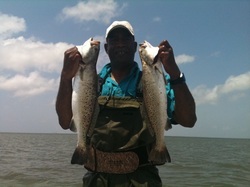 For me when conditions get like they are now the best way to catch them is by wading. Before our trip I asked Lloyd if he had ever thrown a topwater all day long, he said "no", he was under the impression that topwaters worked early in the morning and late in the evening. I explained to him that we were going to prove that myth wrong today, we were going to catch solid trout on topwaters during the middle of the day, and the strong winds were not going to stop us. Well, it did not take long for me to realize I had a man who wanted to become a better fisherman. Lloyd was very attentive and patient, listening and following along with every little bit of advice I could give him. I explained one of the most important things for us to do is remain confident and cover our fishing grounds carefully and slowly. Lately fishing has been a grind at times, but if you put in the time doing the right things at the right places the rewards could be that fish of a lifetime. It only took about 30 minutes for us to start seeing the rewards, Lloyd's first fish of the day was a trout a little over 5#'s. The fish hit a black chartreuse head She dog in about 2' of water. At the same time I was getting blow ups on a pink Skitter walk, not sure the lure or color made much difference as long as you were presenting it the right way. The fish seemed to prefer that slow and steady retrieve, most of the blowups were not big explosions, the lure would just get sucked under and the fight was on. One of the main things I explained that morning is that it is not always best to cast directly down wind. For me, it has always proven best to fan cast, covering many different angles. Many days you will find fish are more willing to blow up a topwater at a certain angle, a 45 degree angle to the wind has been very effective over the years. The lure seems to work a lot better going through the trough of the waves rather than going straight up and over each wave, especially when dealing with a stiff wind and substantial chop. We fished hard all day, 6am till 3pm, and nearly every one of our bites came on top. 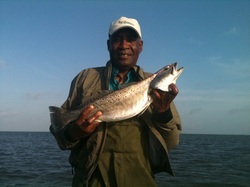 I do not believe that Lloyd will be afraid to throw a topwater during the middle of the day any more. Right now is the time to catch them on top, it is not the easiest thing in the world. But with a little patience and perseverance it is certainly possible. 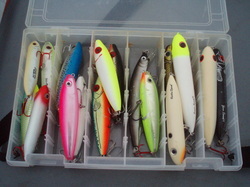 The best topwaters for me lately have been a pink Skitterwalk, Chartreuse/silver Skitterwalk, black chartreuse Shedog, Black superspook, Bone superspook. As we start seeing more and more small bait swimming the shorelines do not forget to down size at times, the spook jr.s, spitting images and smaller topwaters on many occasions will be what they want. Till next time, good fishing.